Artists are varied in their approach to clutter on their workbench. Do you stop to tidy up so your tools are ready to hand or does the disorder somehow allow you to pull some creative inspiration out of the chaos? One of the things that is most troublesome to me is my tendency to collect detritus and keep it in little containers all over my bench. 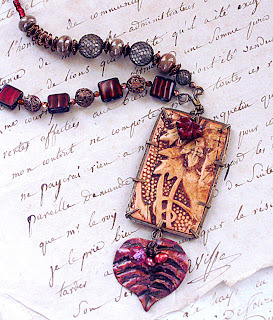 Pieces of previous work that didn't quite make it, creative accidents, orphan beads, pieces of small repoussé work that my husband, Douglas, has made for me, interesting found objects, rocks with nifty textures, rusty bits, twigs-- all of these find a home in various receptacles. Sometimes I feel more like a 19th century naturalist, surrounded by specimens. As I'm about to transform this space into a real working studio, I find myself firmly resolving to corral the clutter and keep my space zen-like and receptive to the slightest nudge from my Muse. 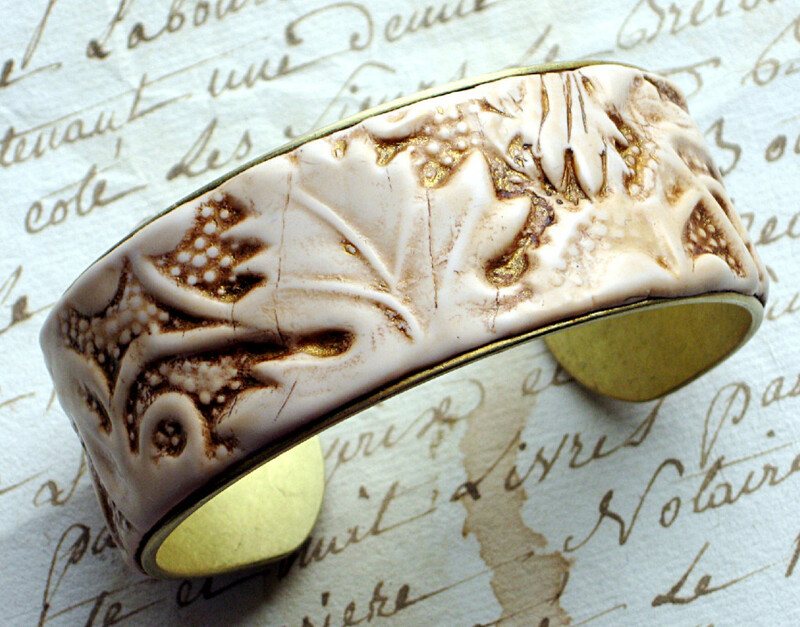 But just this week, while digging through one of my boxes, I discovered a shard of polymer, a sample for the Jane Eyre cuff in faux ivory that I did some months ago. It was too large to make into a pendant so there it sat. I just enjoyed looking at it. 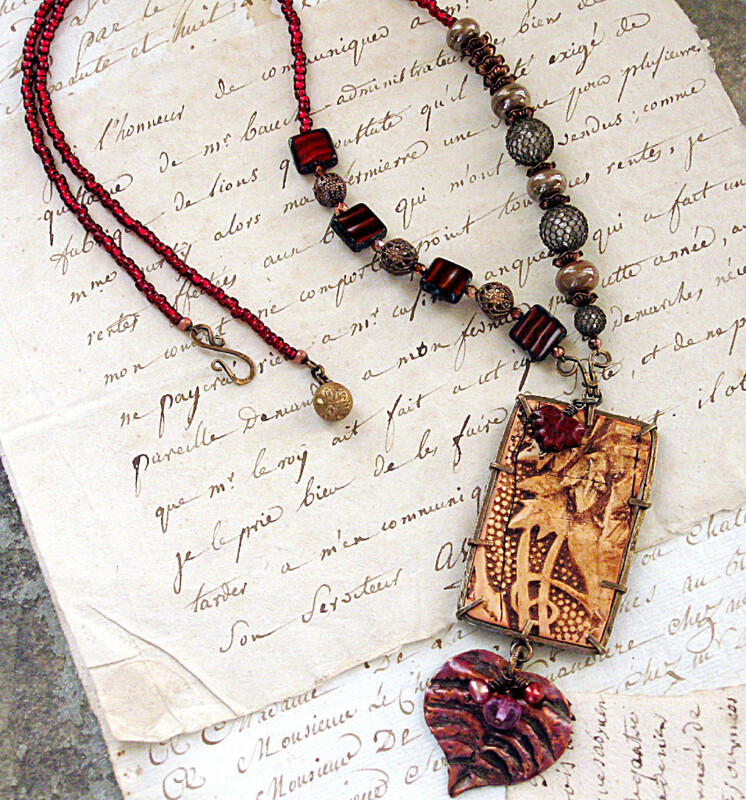 I like making pieces that look as though they are shards discovered in an archaeological dig and then combine them with more modern elements into one whole. The juxtaposition of ancient and contemporary creates a tension that appeals to me. 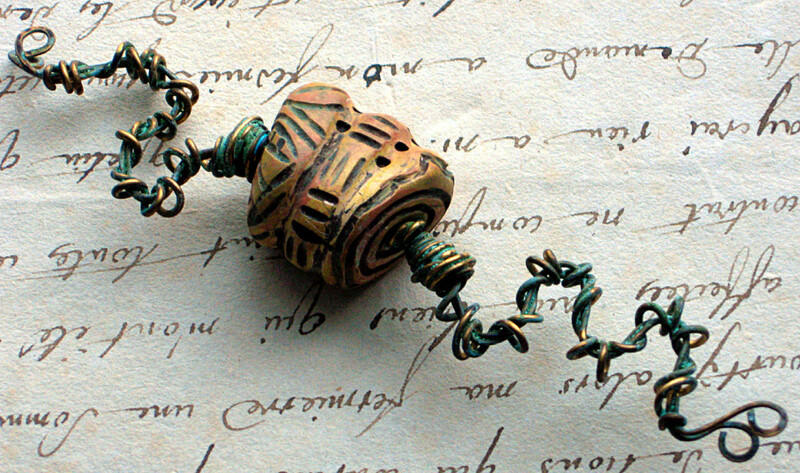 I just happened to have one of Objects and Elements' open bezels in the same box-- sometimes when I buy new findings I don't want to store them away since I tend to forget about them. If I leave them out on my bench, I see them every day and eventually find a use for them. 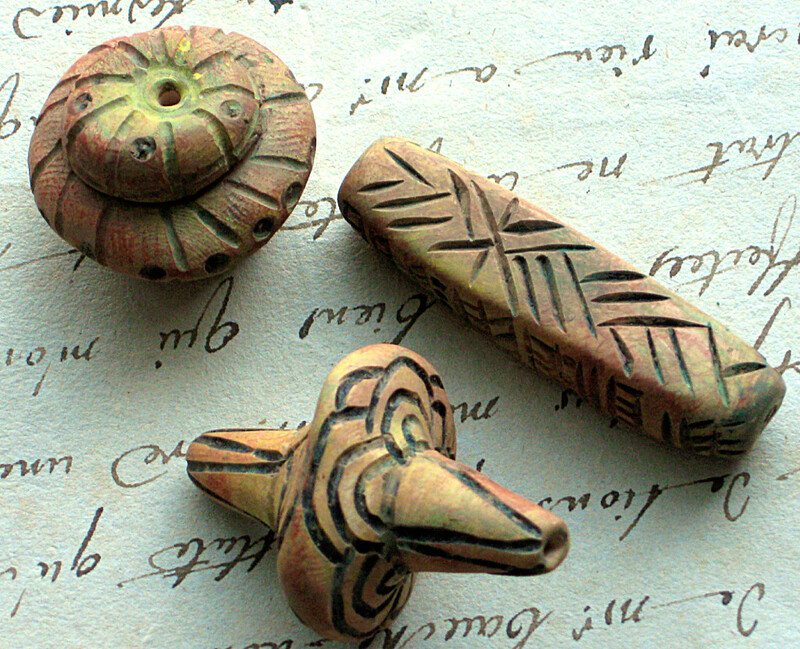 I've used these bezels with several pieces, like the Dance of the Ancients. Intrepid explorer of the artistic landscape that I am, this rectangular bezel was cut, shortened and re-shaped to fit a scrap piece of polymer that I carved a bit and antiqued. So the bezel was fit to the shard, instead of the opposite! The shard was long and rectangular so would allow me to keep some of best motifs. I carefully scored the polymer with an X-acto knife and kept making shallow slices until I could break it off without damage. Some additional cutting and sanding was necessary to make it fit the bezel and then I re-stained the edges with shoe polish. 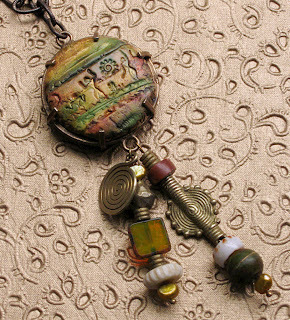 My plan was to make a simple pendant necklace I could wear with jeans and a tee. Yeah, well. The bezel had two attachment loops so I decided to look through my stash for a suitable dangle. 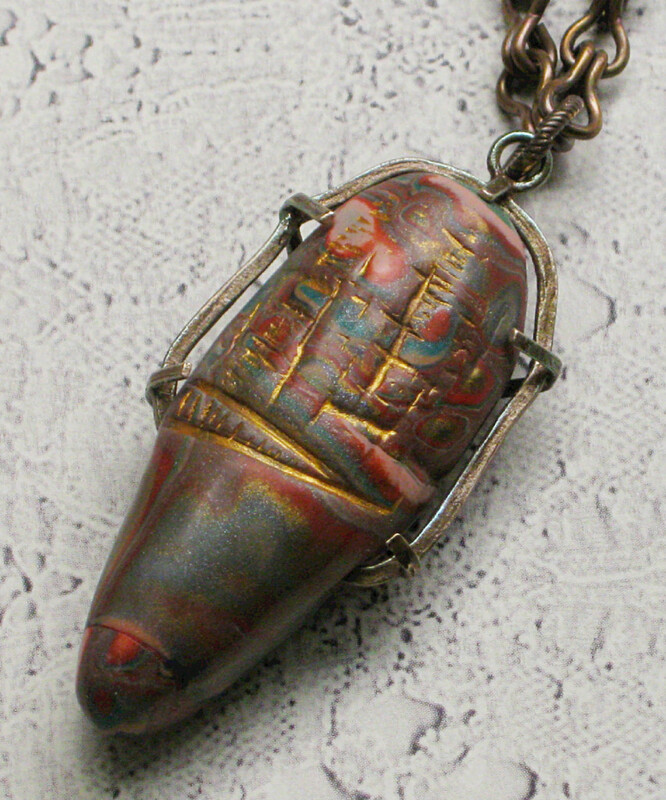 Sitting in one of my containers was a copper leaf that Douglas had done in repoussé and I had heat-patinated to a beautiful purple/copper sheen. I drilled a hole and attached that to the bottom loop. The leaf was a more modern style than the shard but I encouraged that by stringing some garnet-colored square Czech glass beads together with mesh-covered crystal beads interspersed with lampwork rounds. 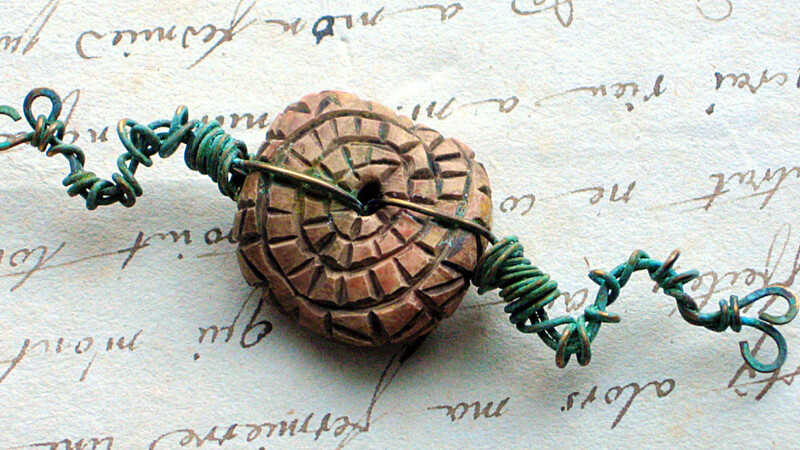 I tried several ideas for the bail, like a piece of brass from a mantle clock that I had taken apart but ended up making one out of 18 gauge bronze wire. 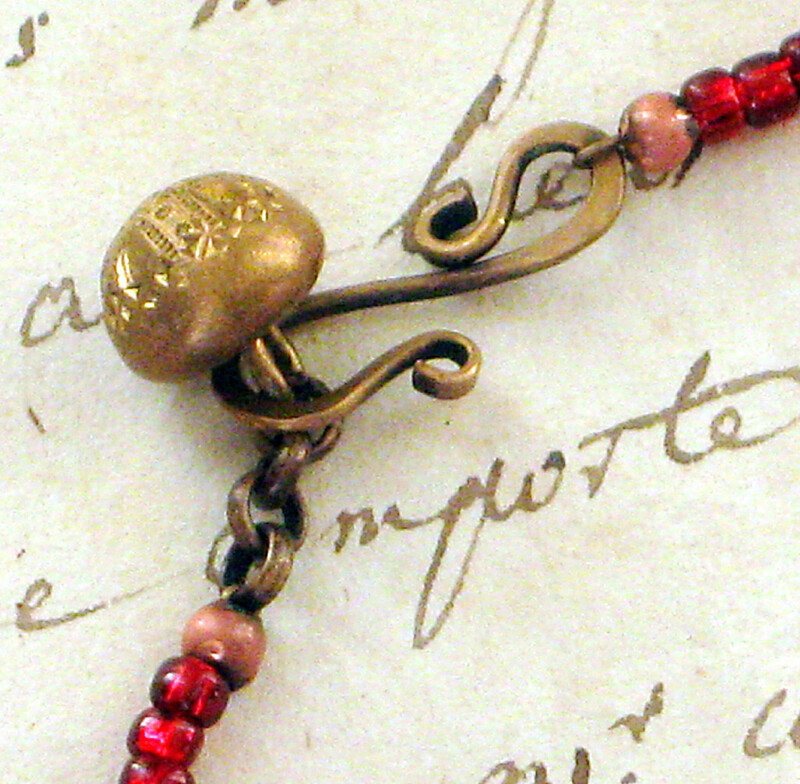 For the clasp, I used an antique etched brass bead on a chain with a handmade shepherd's crook as the loop side. It worked perfectly and was very secure. After completing the piece, I was a bit sad that the repoussé leaf might be leaving my workbench forever-- the fate of all one-of-a-kind pieces. So I thought “why not make a mold from that great little leaf” and got out my Alley Goop RTV (room temperature vulcanizing) putty, and made a mold. I had some scrap clay in a mix of burgundy, green and purple so I used that for the leaf, which turned out to be the perfect base color and added some Jacquard metallic powders and metallic acrylic paint for the copper accents. Maybe earrings to match? So, at the end of the day, I say – keep it but organize it. You never know what treasures you'll find to inspire you at the bottom of your personal benchtop midden. Sometimes here in New England the summer seems to last forever-- it gets a little cooler but the grass stays green and the leaves on our Norway maples won't drop until the weather's about ready to spread that white stuff all over the ground. 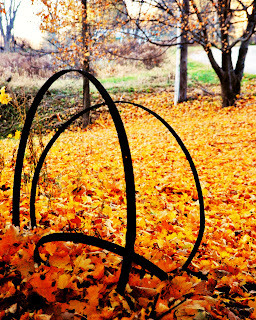 Just last week most of the leaves dropped and created what I call “golden snow”. My photographer neighbor, Lyana, wanted to do a shot of me doing a “leaf angel” in the leaves but I would have had to rake them into a pile for that and they were just too pretty laying in an amber carpet so we settled on the above shot of my front yard. We Vermonters need to soak in all the color we can, for as long as we can, since Spring can be a long way off once the leaves are gone. I dug the flea market find-- below-- out of storage and hung it on my studio door. 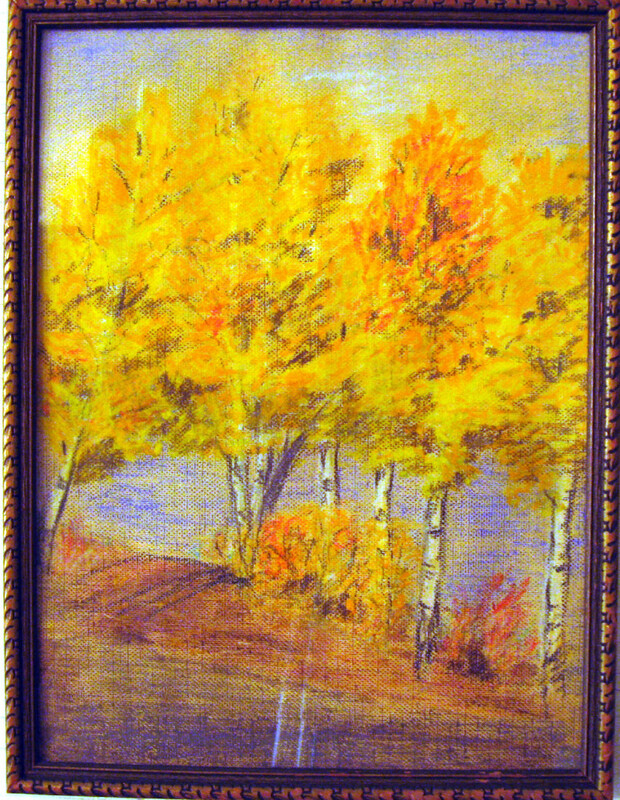 I think it's oil crayon on canvas. You don't have to be a Harry Potter afficianado to love owls. They have been depicted in petroglyphs since the dawn of humankind's ability to interpret our surroundings in drawings and carvings. Lately they've been showing up everywhere in my personal sphere. From the barred owl that calls from our back woods in the early evening dark to the huge Great Horned seen sitting on the wrist of Dowager Queen Eleanor of Aquitaine in the new movie version of Robin Hood, they represent the mysterious and untamed forces of nature. In some cultures they represent wisdom, in others a harbinger of death or illness. I always associate owls with the deep woods, flying through a backdrop of towering dark hemlocks. They may be raptors like hawks and falcons and have been used by humans for hunting prey as well but they have a different vibe for me-- nothing cutesy or precious but more mystical and spiritual. Their gaze is not as intensely fierce as a hawk's. It has almost a zen quality, of just being there, waiting and listening. So, bitten by the “owl bug”, I went in search of images that I could use to carve myself one, with the intention of making a mold so I could create several polymer clay copies for one of my cuff bracelets. While searching Etsy for inspiration, I came across several Victorian brass stampings with carving just spare and detailed enough to satisfy me so I figured why reinvent the wheel, I could use these as a jumping-off point for the cuff decorations. 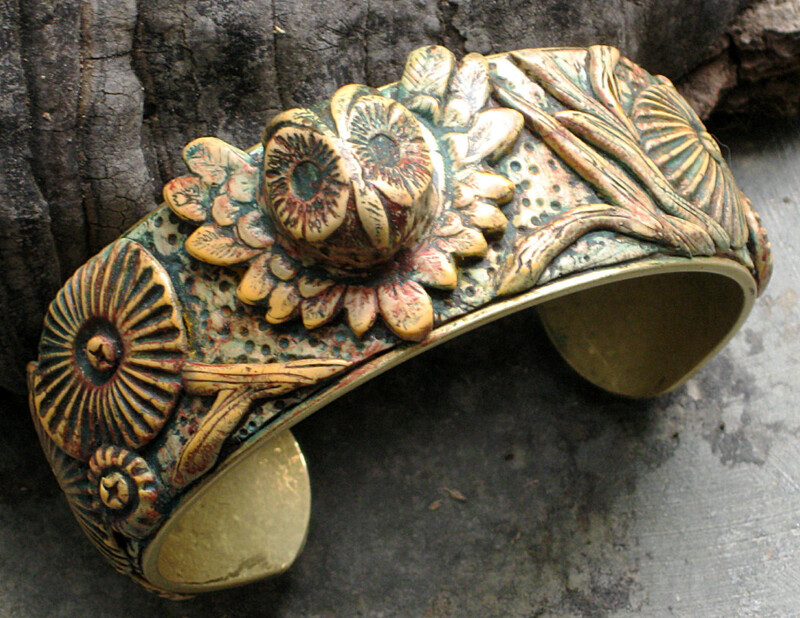 I decided to lay down a textured background on my brass cuff blank so I wouldn't have to cover every inch and would get more decorative mileage out of it. I had one motif that combined the head and wings and when the clay copy ended up projecting a bit more from the flat surface, the effect was of the owl about to fly out of the background. 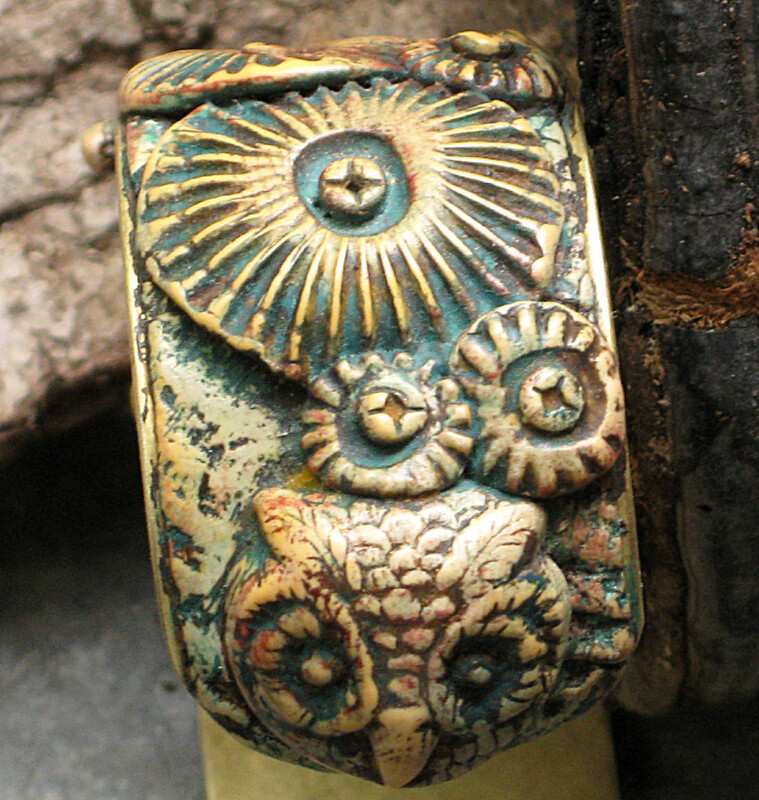 I put two smaller owl faces at the wrists, a highly underrepresented area on most cuffs, in my opinion. I let the composition sit for a day, during which I decided it needed some woodland elements so I added some oversized acorn-y blossoms and some branches. It gave the cuff design a steampunk quality I like. Thanks to Jan for noticing that! After curing, layers of raw umber, a mix of greens and burgundy acrylics went on and were mostly wiped off. It was still missing another tone so I rubbed on tan shoe polish, which added just a bit of yellow tint and mellowed the red and green together. 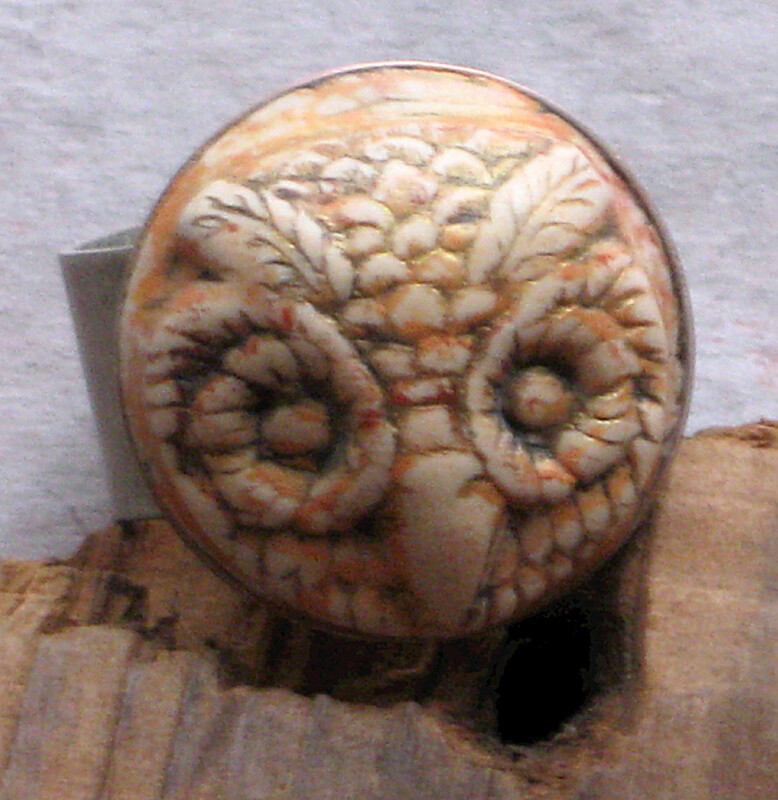 I had some ivory base clay left over and an adjustable ring blank from Objects and Elements so I experimented with filling that with a little owl face. This is the first ring I've done and I opted for a lighter antiquing on it than on the cuff. It's quite comfortable to wear so I'm encouraged to try another-- maybe resin? I've got some bottles of ICE resin calling to me. Next blog-- leaves. Is there a woodland theme here? As I was waking up one morning this past week with my cuppa java I read an older blog post by my friend Barbara Lewis where she muses “Maybe scarcity challenges creativity?”. I've always thought that the fact that I usually can't afford to indulge in a buying frenzy to acquire the latest and coolest finding/gemstone/chain/doo-dah out in the marketplace has definitely made me the “Mother of Invention”. It's made me dig a lot deeper into whatever I was working on, to find solutions that don't require a large cash expenditure. On this blog and others, discussion has been raging lately about what entails copying vs. interpretation. When does a piece become your own and when is it merely a rearrangement of a few minor elements, not really a true embodiment of your own creativity? I don't have all the answers, by any means, but here's something that I do in my own pieces that might be useful as a jumping-off point. Combine the techniques of different artists. 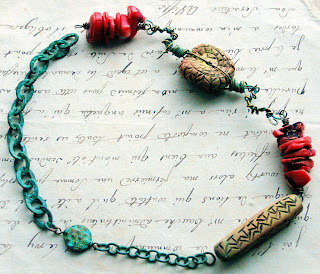 I just completed a necklace using my beads and the beads of two other polymer artists (see my previous blog post, Copycats). I really loved the look of the piece and resolved to explore for myself in some new work the techniques used by my collaborators. Rebecca Watkins, Artybecca, has a very unique carving technique which she generously shared on her Flickr site. 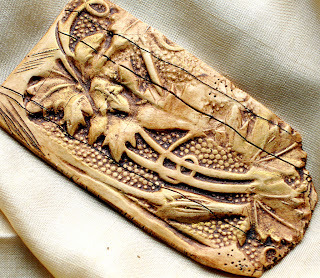 I had bought some Dockyard micro-carvers last year which I had yet to use, which work better on small pieces than standard linoleum block carving blades. I mixed up some of my special formula ivory polymer (special only because it has the proportions of translucent, ecru and white Premo clay that I like), played with shapes, formed and cured the batch of five beads. Getting the hang of carving can be tricky. I now have a few little nicks in my fingers, which will definitely happen if you hold your pieces in your hands while you carve. My husband got tired of hearing me yelp and made me a little jig that locks onto the edge of my desktop to keep the pieces from sliding around. But I just went slowly and not too deeply, following lines I marked on the pieces in soft pencil first. I kept it kind of primitive but kept working into them. Since the beads were not flat in any sense of the word, this took some time in order to not gouge my fingers any further. I found it very meditative. Now the carving was done but they needed some definition and color. Claire Maunsell is a superb colorist and has inspired me ever since I first saw her work on Polymer Clay Daily. She cleverly lays down layers of pigment until she reaches her final color destination. I started with the traditional raw umber paint to define the carving, dabbing the acrylic into the cuts liberally with a paintbrush and lettting the beads sit for a few minutes before wiping most of the paint off with a paper towel. Sometimes I just cure the beads to set the paint and then sand, but these beads were curvy and uneven and wiping was my preferred method. Now to add some real color! I wanted to coordinate the bead color with the patination I was going to apply on the wire-wrapped elements which would pull the whole design together. 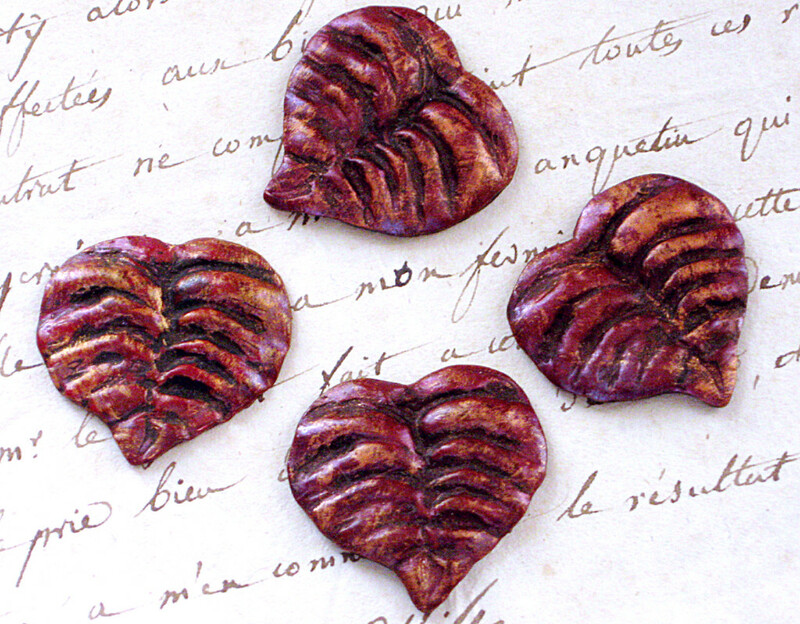 I also was using coral chips I had just purchased that were a rinsed red color. This was going to be a lighter color palette than my usual one-- more of an aurora sunrise with patina green touches. I decided to use a dry-brush technique to lay on the acrylic paint that I learned from furniture painter and master craftswoman, Ruth Pope. You use a small fan brush, one that's made from synthetic fibers and fairly stiff. 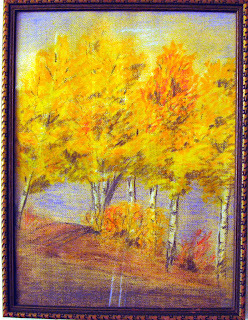 Dip the tips of the brush in your your first color, then brush the excess off on a piece of paper towel. You have just a little color left and it's fairly dry. Now you can brush very gently in a back and forth wrist motion over the area you want to color. It lays down very little pigment on each pass so you can go back and add more if you want. It's almost like you're buffing the surface with the brush. Layers of color enhance one another and create a totally different effect from blending them all together into opacity, which could result in the color of mud! With this dry brush technique, what you have are layers of transparent color, one over another and the base clay color comes through in some places as well. I'm not finished with the necklace yet but I'm very happy with what I've done so far. I also discovered that you can patinate the wirework after you've already threaded it through the polymer bead. 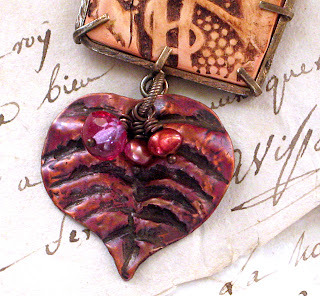 Avoid getting too much of any patina solution on the clay or you'll have to use a commercial alcohol ink remover to take it off. For the green patina, I simply applied the patina solution I purchased from Missficklemedia with a brush in multiple applications until it was the color and coverage I wanted. Shannon LeVart has an excellent tutorial on patination, as well as supplies, for sale on the MissFickle Etsy site that I used for these pieces. Stay tuned for more texture and antiquing experiments-- I've discovered an interesting new direction for me, courtesy of my friends Claire and Rebecca.